Oasia Hotel Downtown in Tanjong Pagar has been named this year's Best Tall Building Worldwide by the Council on Tall Buildings and Urban Habitat (CTBUH), a global authority on tall buildings and future cities that confers the award annually. 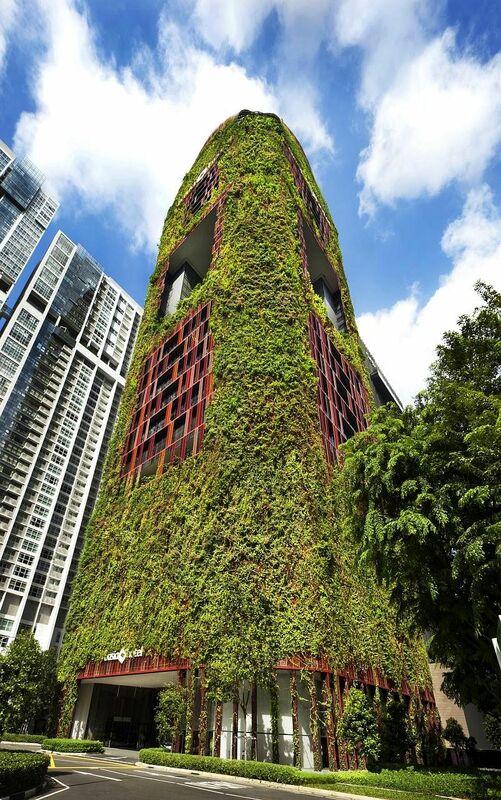 The 27-storey skyscraper by developer Far East Organization, and designed by award-winning architecture firm Woha, features a plant-covered facade of red and green and outdoor communal spaces along its height, which CTBUH felt "connects to the green of the cityscape" and "provides respite and relief to its occupants, neighbours and city". "This project won not only because it incorporates 60 storeys of green walls along the exterior but also because of its significant commitment to communal space," said CTBUH executive director and awards juror Antony Wood. "The tower has given over 40 per cent of its volume to open-air communal terraces in the sky." It clinched the award at the 2018 Tall + Urban Innovation Conference from May 30-31 at Aqua Tower in Chicago. It now joins the ranks of past Best Tall Building Worldwide winners such as the Shanghai Tower in Shanghai, Bosco Verticale in Milan, and One Central Park in Sydney. Oasia Hotel Downtown was added to Far East H-Trust's portfolio in April.